JOHNSTOWN — Halftime adjustments can prove to be just as important as the game plan prior to tip-off. 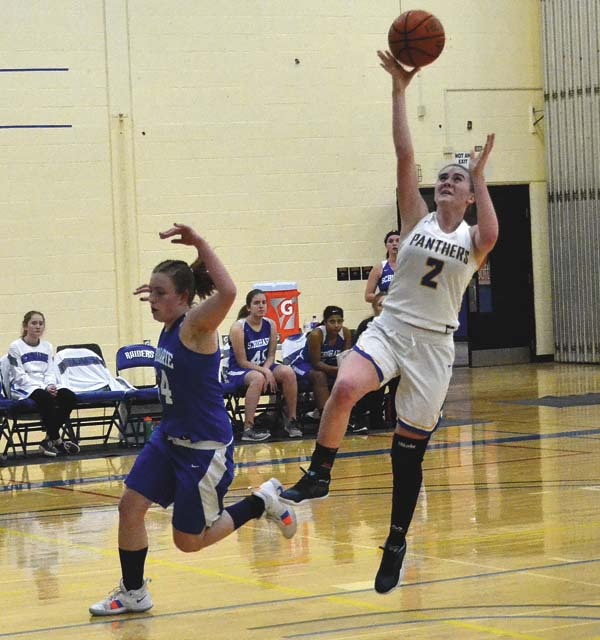 For the Schoharie Lady Indians, their second-half strategy proved effective as they escaped with a 42-36 victory in a Western Athletic Conference crossover contest over the Mayfield Lady Panthers Saturday at the Fulton-Montgomery Community College gymnasium. After allowing 25 points in the first half and trailing by 10 points, the Lady Indians focused their attention on the defensive side of the ball. In the second half, Mayfield was held to just 11 combined points. 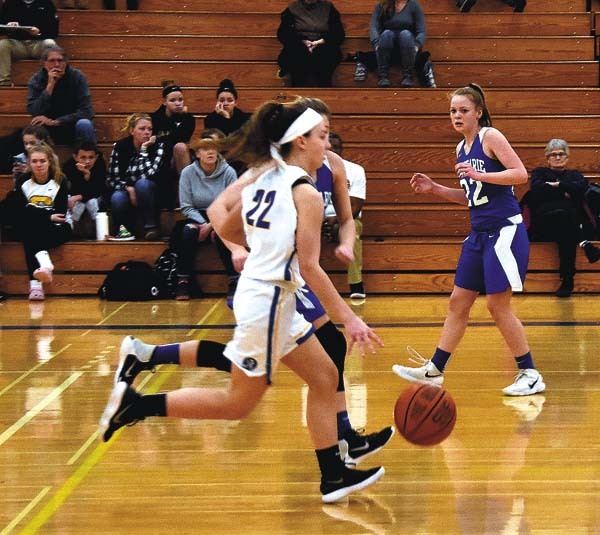 Heading into the game, the Lady Panthers had gotten the upper-hand on Schoharie twice this season with narrow victories of 41-38 and then 41-39. The effort on defense seemed to get the offense going as the Lady Indians scored 16 points in the third quarter. A large part of the offense came from Julie Lehoe who scored nine points on three 3-point attempts in the quarter. Lehoe ended with 13 points, five rebounds, and one assist. For Mayfield, they came out of the locker room after halftime ice cold. With only seven points scored in the quarter, they converted on just three field goals. Trailing by just one point at the beginning of the final quarter, the Lady Indians looked to Hannah Cater who continued her strong play from the first half as she went on to score six of the teams final 11 points. Lehoe finished with a game-high 18 points and chipped in an additional five rebounds and two assists. Coming out of the gates, Mayfield rode the hot shooting of Taryn Lafontaine as she scored eight of the teams nine first quarter points. She ended with a team high 12 points, while securing two rebounds and added an additional three assists. 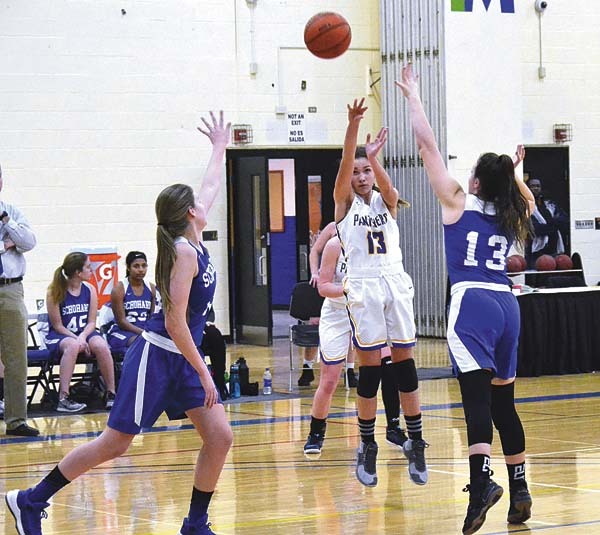 With scoring contributions of five points from Kelsey Meca and four points from Katarina Agerter, the Lady Panthers were able to break the tie at the end of the first quarter and outscore Schoharie 16-6 in the second quarter. The win tonight snapped Schoharie’s five-game losing streak and gives them an overall regular season record of 8-12. With this loss, Mayfield ends their regular season with an even 10-10 record and will look to correct the mistakes from Saturday before sectionals begin. FONDA — Ellis Dannible finished with 12 points to lead Cobleskill-Richmondville to a non-league victory over Fonda-Fultonville. Lindsay Becker and Sabrina Pressley each had eight points for the Bulldogs, who led 20-9 at the half on their way to the victory. Marilyn Whitcavitch had 11 points and 15 rebounds to lead Fonda-Fultonville, while Kayla Smith added nine points. 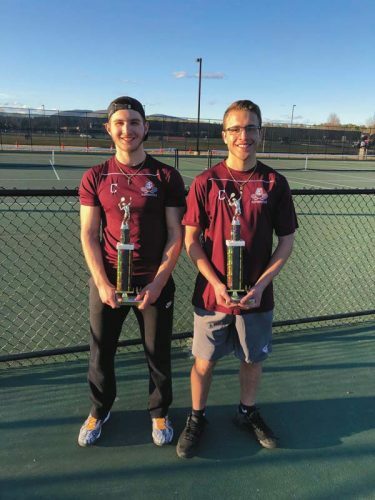 FFCS (13-6 overall) is scheduled to face Duanesburg in a Western Athletic Conference crossover contest Tuesday at Fulton-Montgomery Community College at 4:30 p.m.
Becker 3-1-8, Dannible 5-0-12, Meade 0-1-1, Osterhaudt 1-3-5, A. Pressley 3-0-7, S. Pressley 3-2-8. Totals 15-7-41. Cusack 1-1-4, Duval 1-0-2, A. Lombardoni 1-0-2, L. Lombardoni 2-0-4, Smith 3-1-9, Whitcavitch 5-1-11, Wilder 1-0-2. Totals 14-3-34. 3-point goals: Cobleskill-Richmondville 4 (Dannible 2, Becker, A. Pressley); Fonda-Fultonville 3 (Smith 2, Cusack). DOLGEVILLE — Hannah Stack finished with 25 points and 16 rebounds to lead Dolgeville to a non-league victory over Richfield Springs. 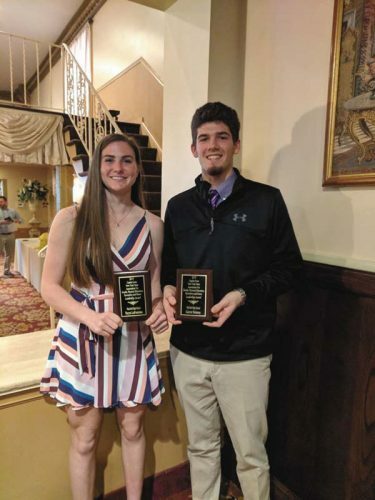 Sandra Gonyea had nine points, four assists and two steals for Dolgeville (10-9 overall), while Ryanne Williams had seven points, 12 rebounds, two steals and two assists. Amy Seamon scored 14 points to lead Richfield Springs. Teachout 2-0-4, Seamon 4-3-14, Harford 3-0-7, Snyder 1-0-2, Worobey 2-0-4, O’Connor 1-0-3, Butler 0-1-1, Oakley 0-1-1, Connolly 1-0-2. Totals 14-5-38. Gonyea 4-0-9, Williams 3-0-7, Stack 10-5-25, Nichols 0-3-3, Spofford 1-0-2, Frasier 1-1-3. Totals 19-9-49. 3-point goals: Richfield Springs 5 (Seamon 3, Harford, O’Connor); Dolgeville 2 (Gonyea, Williams).